Fat is very tasty and useful product. It is eaten either raw, fried, boiled, baked, smoked or salted. Besides, they can be stored for future use. How to store bacon? There are many recommendations. - 130 grams of salt. For the preparation of 30% salt solution will connect 50 grams of gelatin and red pepper with one liter of water, mix thoroughly. To prepare the brine connect one teaspoon of sugar, 130 grams of salt, 0,3 teaspoon of dietary nitrate one liter of water. Take the fat with the skin (the thickness of the skins shall not be less than 1.5 centimeters), clean it, then put in salt brine and let sit in the fat for a few hours. Then remove the bacon from the brine and place in a glass or enamel pot, skin down. Pour the fat cold brine, which you have prepared in advance of water, salt, sugar and nitrate. Soak in cold brine bacon at least eight days in a cool place, the temperature of which should not be less than 4 degrees C.
After eight days of exposure, remove the fat and pour over it boiling water. Make a solution for this combine and thoroughly mix the water, gelatin and red pepper (to taste) and soak this in hot (65 degrees C) solution fat. Hold fat at least half an hour in a solution of gelatin, water and red pepper and then remove and dry, so that the glass excess moisture. Prepared fat smoke cold smoked (20-25°C) smoke during the day. Lay bacon in bags and hang it or put it in a wooden box with sawdust. Keep the bacon regardless of the method of Smoking is always in a dry, cool and well-ventilated room at temperatures from +3 to +8 degrees. It is not recommended to store bacon in rooms with high humidity, otherwise the bacon spoils quickly. 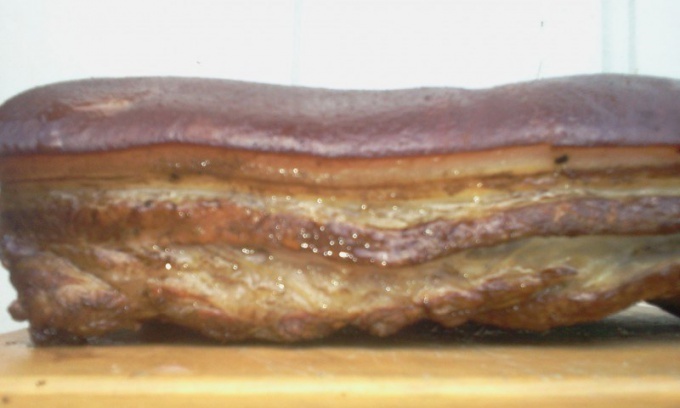 Smoked bacon can also be stored as a salt, it will not lose its taste.